The US employment report and its well known Non-Farm Payrolls data will be released this Friday September 6th. 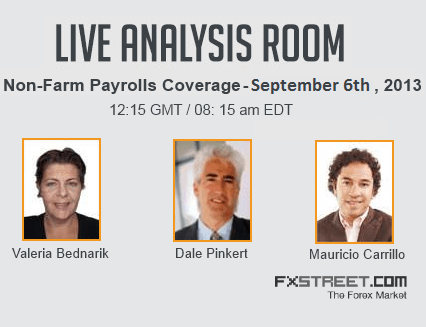 Dale Pinkert, Valeria Bednarik and Mauricio Carrillo will offer a live coverage in our Live Analysis Room and from the FXstreet.com homepage! That will be from 12:15 GMT until 13:15 GMT (that is from 08:15 am EDT until 09:15 am EDT): pin the date and follow the ultimate NFP! Dale and Valeria will do a preview of the data and comment the immediate market reactions as well as give their views for the middle and long-term situation in the USA and for the USD and major currencies. Mauricio will be giving the NFP numbers just when released and gives the main components of the data. The Live Analysis Room is a free service launched by FXstreet.com in June that offers assistance, market analysis and strategies in real time, 4 hours a day, every weekday. A strong community of Forex traders of all levels has been built in the #FXroom, all eager to learn, share and become better traders. Approximately 100 traders meet every day during the Live Analysis Room, from 13 to 17 GMT. Through the video streaming service Ustream, Dale Pinkert broadcasts his charts and webcam, as well as his guests’. Traders are able to interact through a chat window that everyone can follow. This Friday’s special event will be broadcast from the homepage of FXstreet.com, in top of the usual location of Live Analysis Room. When the NFP coverage itself is finished, you’re more than welcome to attend the LAR that will last 3 more hours, from the usual page of the service. do i need to make any registration in other to become eligible for viewing the ‘live Analysis Room’? You need an FXstreet.com account to be part of our Live Analysis Room. But it’s totally free! If you go here: http://www.fxstreet.com/webinars/live-analysis/ – click on “Enter the room” and follow the steps. We hope you’ll enjoy! Previous Previous post: The Trader of the Year Contest 2013 is back!